In Brazilian traditional medicine Arctium lappa has been reported to relieve gastrointestinal symptoms while in western herbal medicine it is usually considered more as an alterative and depurative than an anti-inflammatory. Arctium lappa contains lignans (arctigenin, arctiin), inulin (in the roots), organic, fatty and phenolic acids. 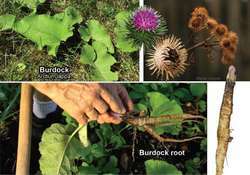 Arctium lappa, commonly known as burdock, is an important medicinal plant in China (TCM) and Europe which has been used for thousands of years (Van Wyk and Wink 2004). Study on effect of Arctium Lappa on experimental diabetic mice. Anti-proliferative and a poptotic effects of butyrolactone lignans from Arctium lappa on leukemic cells. Two polyacetylenic phytoalexins from Arctium lappa. In vitro anti-inflammatory effects of arctigenin, a lignan from Arctium lappa L, through inhibition on iNOS pathway. Arctigenin isolated from the seeds of Arctium lappa ameliorates memory deficits in mice. Inhibitory effect of Arctium lappa Linne on compound 48/80-induced mast cell activation and vascular permeability. In this study, the ameliorative effects of arctiin, a natural compound isolated from the fruits of Arctium lappa, on rat glomerulonephritis induced by cationic bovine serum albumin (cBSA) were determined. A biologically active fructan from the roots of Arctium lappa L, var.